I'd like to introduce to you Gaspard, the only fox, as far as I know, to have not only a Twitter account but more than 5,000 followers. Foxes have been important animals in folklore and art throughout our history and they wind their beautiful and sometimes devastating way through many landscapes. Recently, they've moved to town...well, why should they go scrabbling for chickens in uncertain circumstances when there are dropped burgers and tasty kebabs and nice suburban dustbins to investigate? They've had both a bad press and a good press, depending on the writer and the artist involved in the story but here, there's no denying Gaspard's charm and beauty. Gaspard is one lucky fox. He arrives at a time when memoirs are popular. Anything that has the stamp of reality or authenticity is fashionable and Gaspard is a very real fox. Not only has he got a Twitter account but he's chosen his narrator and artist supremely well. The person he visits on a daily basis (and I've seen the videos on Twitter and very delightful they are, too) is Zeb Soanes, who's media savvy and well-connected (he's a newsreader on BBC Radio 4) and seems a very kind chap to boot. He and Gaspard have a lovely friendship and to bring this friendship to light, Zeb has chosen a terrific artist who seemingly can turn his hand to anything. I wrote on this blog about his beautiful collage illustrations for Jackie Morris's Mrs Noah's Pockets. This book is completely different. I see in each spread the influence of other artists in the best possible way: nods to excellent people like Ludwig Bemelmans (who gave us the lovely Madeline books) and in the last picture I have posted here, the great Edward Ardizzone. 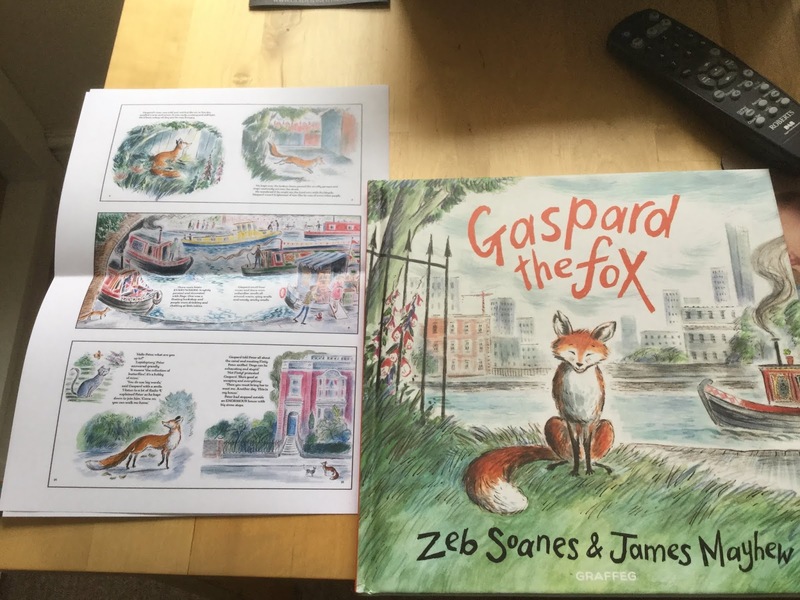 As we follow Gaspard's adventures, we're taken through a London which not all the touristy depictions of the city bring to the attention of visitors: the canals, the suburban houses, the towpath, the park benches. Gaspard has friends too. There's Zeb of course, but also Peter the cat, and Finty the dog, who are fully rounded characters in their own right. This, above, is the illustration that makes me think of Ardizzone. After his adventures, Gaspard goes back to Zeb's house....and I won't tell you how the book ends but it's all you would wish for. What does seem certain is that Gaspard is going from strength to strength and I'm quite sure there will be other books about him and his friends, both animal and human. Graffeg is a Welsh publisher which pays extra attention to the small details of the production of the book. Above you will see the Press Release. It's not every fox that gets such treatment. There are paw prints on the end papers. The font is beautiful. The whole thing is a total pleasure and the ideal gift, not only for fox fans. I can't wait to see what Gaspard is going to get up to next. Meanwhile, do follow him (and Zeb and James too!) on Twitter! If you have a Festival near you this summer, there's a good chance they'll all be there. What a feast of a review, Adele! I was immediately intrigued by the "Ardizonne" cover, which fits with the Gaspard name, I suppose. 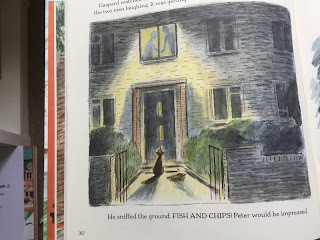 Glimpsing the illustrations at the start of your review, I half-expected the book to be set in Paris but no, a London setting to enjoy and/or feel nostalgic about. I am now off to be be-foxed on twitter. Thank you.